An online petition that garnered more than 12million signatures was seen by the government as an indication of what might happen if the country were to be allowed to leave the EU on 29 March. Mrs May has been backwards and forwards to Brussels recently in a huge timewasting exercise, knowing, all the time, that constant non-agreement on a leaving policy would bring the country to a position where MPs would not be able to accept a potentially-distastrous 'no deal Brexit', and would rescue matters at the last minute, by remaining in the EU. One thing the government did not reckon with, however, was the public's determination, on both sides of the argument, to see the issue through to its conclusion. Gun shops up and down the land have reported brisk business, and residents have been seen sharpening knives, and anything else that be fashioned into a stabbing tool. 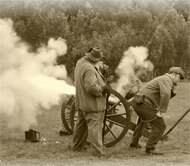 Cannonfire has been heard throughout the countryside, and people have been learning how to eat pheasant.